located in Winston Salem, has held its place on on campus since 1964 and has grown as a gallery and cultural center over the years. The Elberson Fine Arts Center features work from both prominent and local artists at any given time, and always aims to not only enrich the student’s understanding of art, but the local community’s as well. Currently the Elberson Center is home to a multimedia art exhibition titled “Jupiter Optimus Maximus.” The exhibit features twelve pieces of artwork from three artists. There’s twelve pencil and pastel pieces from William Fields, twelve paintings from Robert Ruckman and a dozen electroacoustic sound’s by Samuel Allen Taylor. The artists featured brought a unique style to the table, often differing in the medium they use. Ruckman is young self-taught artist who employs hermetic and spiritual practices into his art. Fields is a veteran artist who strongly believes in the use of ‘the line’ as a means to give the work a true central meaning. Taylor is also a seasoned sound artist who’s won awards for his work, and has had his work shown in New York City. The works from all three artist were grouped together and given the same title in order to reflect an aspect of the human condition or psychology. The pieces featured from the three artists were grouped into the following ‘meditations’: Electricity and Will, Cosmic Love and Wisdom, Knowledge, Magnetism, Life Principle, Chemical Elements, Fertility, Radiation, Equilibrium, Cause and Effect, Gravitation and Crystallization and lastly, Evolution. It is also very important to note that the exhibition shares the same name as an Ancient Roman temple. Considered the most important temple of its time and was dedicated to Jupiter and his companions Minerva and Juno. The three artists in this art gallery, very much act as creative gods in the vein of Jupiter, Minerva and Juno. Their relationship becomes even more uncanny to those of the Roman gods as the three artists also happen to live in the same neighborhood. The open atmosphere of Fields’ drawings represented the serenity and sense of control that the god’s possess over human life. This is in contrast to Ruckman’s paintings’, whose incoherent nature seemed to represent the human mind as it perplexes itself with the ideas of divine intervention, or displeasure with the god’s. Some of the standout pieces were Fields’ ‘Animus’ and ‘Blue Volition and Taurus.’ as well as Ruckman’s ‘Causation,’ ‘Alchymia,’ ‘Progenitor’ and ‘Taurus.’ These pieces especially utilize great color choice and style, and really propel the themes of the twelve meditations which the artwork is centered on. During my visit to Taylor’s section of the exhibit, the audio element of his works were not playing which I feel would have greatly helped with the experience, as the sound design was supposed to bridge Ruckman’s chaotic expressionist paintings with Fields’ precise drawing style. A part of the exhibit that I feel may have been overlooked is the use of lighting for the visual pieces. When you walk through the initial art space the works are featured under traditional showroom lights which give off a warm and vibrant vibe. However when you cross into the final room that features the last three installations, the room is filled with natural light that pours through the window and through a white curtain which creates a ‘heavenly’ feeling. 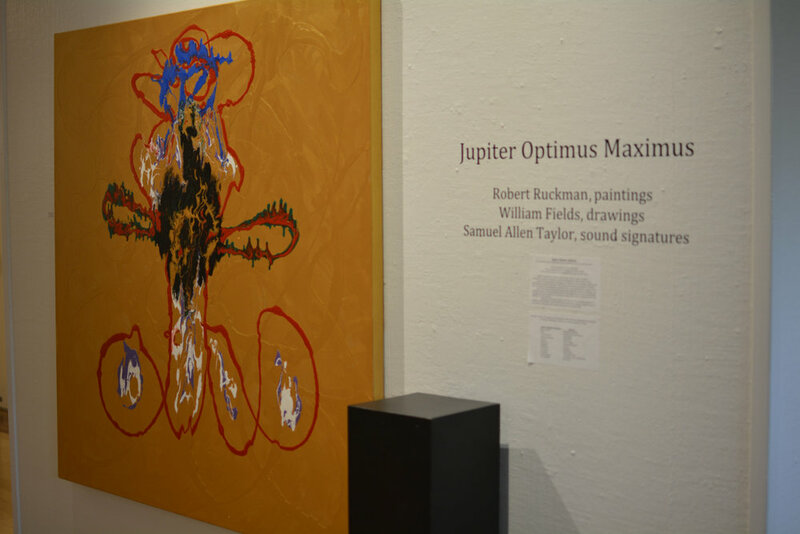 The “Jupiter Optimus Maximus” exhibit is currently open through April 30, 2017 in Winston-Salem. For more Information about the Salem College Elberson Fine Arts Center as well as background information about the artists and the Jupiter Optimus Maximus exhibit, visit jupiteroptimusmaximus.net.